Fighting fire: Water can be taken from rivers, lakes or local houses and can reach a distance of 30 metres. As the motorbike is small and convenient, it can access remote areas where cars struggle. Back in 2010, a man from the southern province of Kiên Giang called Nguyễn Cao Thượng saw a fire in a local market. Fire trucks could not reach there to put out the blaze. He then decided to put fire equipment on his scooter. His scooter fire engine has since helped out at fourteen fires. 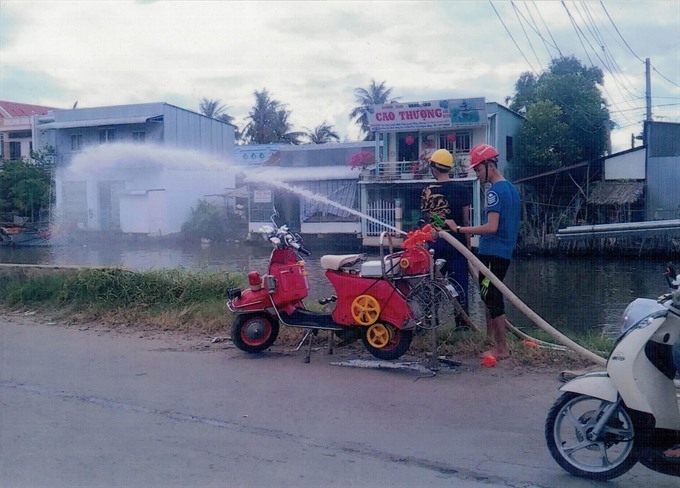 With a passion for machines and engineering, Nguyễn Cao Thượng, a 51-year-old mechanic from the southern province of Kiên Giang, has transformed his Vespa scooter into a firefighting vehicle, and used it to battle dozens of blazes since 2010. “When a fire breaks out, this motorbike [scooter-turned-fire engine] can do the work of many people,” said Thượng. Thượng is a native of Long Xuyên in An Giang Province. In 1999, due to problems in failed business and debts piling up, he and his wife, along with four children, moved to the remote Vĩnh Thuận area, where they had no acquaintances. During the last days of the millenium, when Vietnamese are busy shopping for New Year celebrations, Thượng was unable to afford gifts and treats for his family. While walking over Vĩnh Thuận bridge, he thought that a motorcycle repair shop could mean something to the family. Even without money, Thượng decided to hire land and set up a shop next to an old hospital for his new business. It was short lived, however, closing four or five months later due to a land clearance project. He then began work as a mobile mechanic along the province’s waterways. After nearly four years, he could finally afford a suitable piece of land. In 2010 Thượng witnessed a fire at the market in Vĩnh Tiến Commune and then later, another fire in Vĩnh Thuận District. The flames were high enough to overwhelm the locals and their rudimentary equipment, while the fire brigade failed to arrive in time. The houses were subsequently destroyed and a number of people were injured. “The image of the fire, those who suffered severe burns, and those fainting on realising that their whole property had burned down haunted me,” said Thượng. “Professional fire trucks do not always come in time or have access to all sites. If there was a fire in remote or rural areas, then how could they reach it? Why not use vehicles that are small and convenient, like a motorbike,” said Thượng. Encouraged by the idea, he decided to ‘sacrifice’ his Vespa for the ‘experiment’. The biggest obstacle was adapting the Vespa’s engine to pump water with enough force to extinguish large fires. To collect the necessary tools and equipment, he had to go to An Giang, Cần Thơ and down to Cà Mau Province. After a year of work, and buckets of sweat, the bike was finally ready for use. He installed a new horn, slapped on a red colour scheme reminiscent of fire trucks across the world, and added a small fire extinguisher just in case “my own bike burns”. He tested the new creation on the banks of the canal. “The bike had the look, but in reality the water was only being sprayed 5 metres high. There were some laughs, but I persevered. A few sleepless nights later and I had managed to make the pump five times stronger,” said Thượng. “There was a night when my ’fire engine’ bike was still unfinished, and a person ran to my house shouting about a fire. I followed him, bringing along my tools and bike. “After battling the blaze for more than an hour, we eventually extinguished the fire,” said Thượng. To make the firefighting work more efficient, he began on a second set of wheels. He had to buy another second-hand Vespa bike. “It must be Vespa because my first firefighting bike was made from a Vespa due to the fact that the engines on these scooters can cool down by themselves. Others, including Honda Waves or Dreams motorbikes, only cool down when they are moving,” said Thượng. Water can be taken from rivers, lakes or local houses and can reach a distance of 30 metres in height. As the motorbike is small and convenient, it can access remote areas where fire trucks struggle. To rebuild his bikes like that, Thượng had to spend money, time and effort. “No one expects fires. It’s good that I was able to make a firefighting bike to help others. I do not expect to be paid for this job,” he said. Thượng’s firefighting bike was runner up in the third Technical Creativity Competition in 2011 and was invited to be exhibited at the Việt Nam Agriculture Fair held in HCM City. Seeing that many farmers were being poisoned when they sprayed pesticides on their crops by hand, which is costly and inefficient, as well as dangerous, Thượng invented a multifunction machine that can spray pesticide, fertilise and haverst crops. The machine weighs only 190kg, meaning it can be operated easily over the rice fields of Vĩnh Thuận. It can also sprinkle pesticides over an area of 20ha per day. The Department of Science and Technology of Kiên Giang supported Thượng in filing for intellectual property rights, said deputy director of Kiên Giang’s Department of Science and Technology, Nguyễn Xuân Niệm. “I have always admired Thượng’s dedication. He works towards the benefit of others. He has developed and built a number of innovative machines with many practical functions to help farmers,” said Niệm. Someone who has a passion for machines and engineering loves them so much, he does not worry about how much time or money he spends on them. Transform means to change something from one thing into something else. In 1999, due to problems in failed business and debts piling up, he and his wife, along with four children, moved to the remote Vĩnh Thuận area, where they had no acquaintances. Debts are amounts of money you owe someone else. Acquaintances are people you simply know. They are neither friends nor enemies. A millennium is a period of a thousand years. He then began work as a mobile mechanic along the province’s waterways. In 2010 Thượng witnessed a fire at the market in Vĩnh Tiến Commune and then later, another fire in Vĩnh Thuận District. To witness something means to see it happen. The flames were high enough to overwhelm the locals and their rudimentary equipment, while the fire brigade failed to arrive in time. To overwhelm, in this case, means to drown. Rudimentary equipment means basic, not advanced, equipment. If the images of the fire haunts Thượng, they enter his mind. To have access to all sites means to have a way to be able to reach them. When someone makes a sacrifice, they give up something to make something else possible. To adapt a Vespa’s engine to pump water means to change it a bit so that it can do a new job. To extinguish fires means to put them out. “Many people said I was just wasting my time on the bizarre bike,” said Thượng. If something is bizarre it is not as you would expect it to be. He installed a new horn, slapped on a red colour scheme reminiscent of fire trucks across the world, and added a small fire extinguisher just in case “my own bike burns”. To install a new horn means to put a new one on the scooter. If the red colour of is reminiscent of fire trucks, it is like that of fire trucks. A creation is something someone has made. There were some laughs, but I persevered. A few sleepless nights later and I had managed to make the pump five times stronger,” said Thượng. To persevere means to keep on trying. When firefighting work is made more efficient it is easier to do because there are fewer things that get in the way. A runner up is someone who comes second in a competition. To exhibit at a fair means to show your products to the public at the event. Pesticides are chemicals that are used to kill pests. Inefficient is the opposite of efficient. To invent something is to make it from an idea and be the first person to do so. A multifunction machine is one that can do many things. The Department of Science and Technology of Kiên Giang supported Thượng in filing for intellectual property rights, said deputy director of Kiên Giang’s Department of Science and Technology, Nguyễn Xuân Niệm. To file for intellectual property rights means to ask to own an idea that nobody may copy and make money from. If something benefits you, it helps you and is good for you. “He has developed and built a number of innovative machines with many practical functions to help farmers,” said Niệm. An innovative machine is one that came about as a result of fresh ideas. Nguyễn Cao Thượng’s firefighting bike was winner of the third Technical Creativity Competition in 2011. Nguyễn Cao Thượng’s scooters have both been Vespas. Water from the hoses on Nguyễn Cao Thượng’s scooter fire fighter can reach 30 metres into the air. Nguyễn Cao Thượng’s multifunction farm machine weighs 109kg. 1. False; 2. True; 3. True; 4. True; 5. False.